There’s a Post, Here’s a Post? Okay, so I’ve been thinking about how I actually want to set up this webpage. Part of me says, “Lindsay, be business-minded. Put all your services offered and leave it at that.” The other part of me says, “No way! That’s not FUN!” So, I think I’d like to see if I can include ya’ll a bit more. I’m thinking posts of current projects, furniture I’m thinking about, maybe even a “how-to” once in a while… and PICTURES! Always pictures! ‘Cuz what’s fun about just a bunch of words about how something LOOKS? Eyeballs up here, Missy! Charlie’s the dog, not the chair. Ha! You see what I did there? Charlie and Lucy? Heehee… erm… ahem… Anyway, I was so excited to start, I forgot to snap a pic of Lucy before I took the legs off. (And I just noticed you can totally see some of my other projects in the works in the background! Stay tuned for updates on those!) Charlie and Lucy had been loved very much, but they needed some new fabric and foam to usher them into the newest generation. Wanna see them now? Heeeeeeeers… CHARLIE! That’s some good Mid-Century Modern right there, folks. Good stuff! Next Post This Card’s For You! Excellent Work Sis, even one of my favorite colors! They look wonderful! I have a pair of cool chairs from an uncle, originally clad in Aqua. I’ll try to send pics. I’ll need your help naming them & figuring out how to rehab them. This is where I wish we lived closer so I could just drop them off & pay you to give them new life! Of course, keeping them clad in Aqua! Holly, that would be so awesome! Very cool. I love the name, the artwork, your words, and what you do! The after chairs are gorgeous. Your name is now imprinted in my brain if/when I need something reupholstered ;). That’s so sweet of you to say, Jan. Thank you! 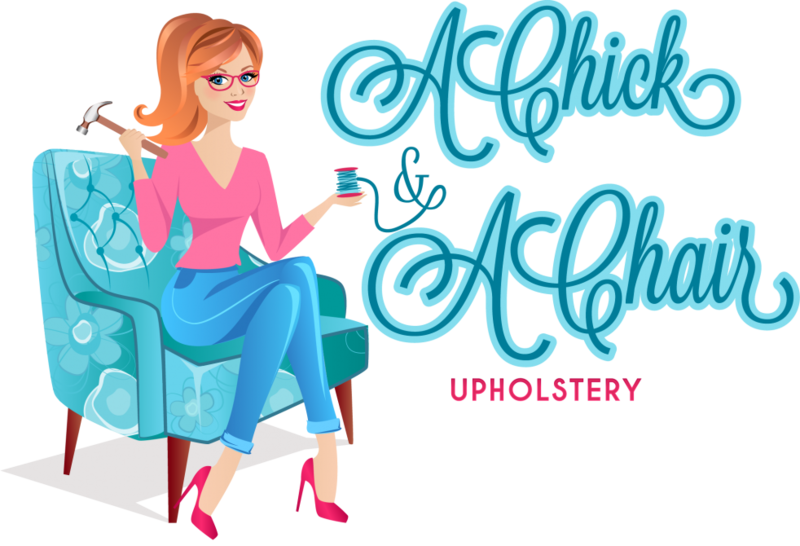 Enter your email address to follow A Chick & A Chair and receive notifications of new posts by email.